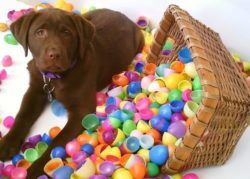 Bring your pup, grab a friend, and follow along as your dog sniffs out the hundreds of treat-filled eggs scattered across the SoMa StrEat Food Park for the 3rd Annual Easter Egg Hunt for the Dogs. Enjoy food trucks and drinks for you, and treats for Fido and more. Please bring a basket to collect your Easter eggs. 6:30 pm: Please Check-In upon arrival at the entrance of the SoMa Streat Food Park. 6:45 pm: Release The Hounds. The egg hunt begins. 7:15 pm: The Golden Ticket. Stick around to test out your luck at the raffle. 7:30 pm: Food, Food and more Food. The dogs have filled their bellies with goodies and now it is your turn.